Source of ideas, inspiration and technical guidance related to creative application of color and special effects in product design & branding. 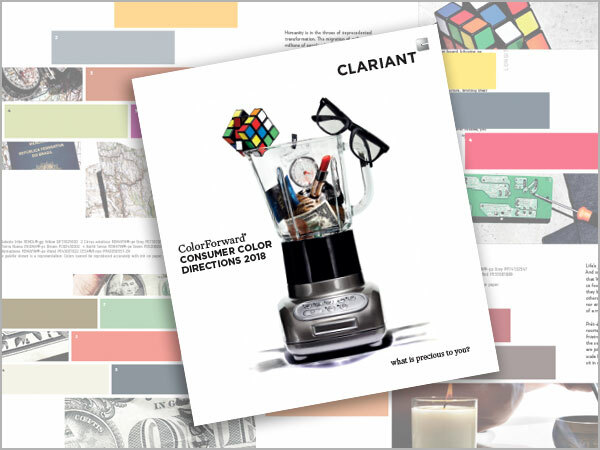 Working in close collaboration with Clariant’s color experts, Blass Marketing participated in a weeklong workshop to listen, discover and vet consumer trends observed from all regions of the world. The group then instilled the findings to four themes that would have major impact on consumer products and color preferences in the coming year. Blass Marketing researched each trend, citing examples throughout the world, to provide deep and broad international relevancy. Powerful of creative copy was crafted to convey compelling stories. The emotional graphic design for each theme combines photography, illustration and artwork to provide innovative and creative inspiration. ColorForward is an internationally recognized forecast of color palettes associated with each of the trends influencing consumer behavior. 2018 is the 13th year that Blass has provided strategic and creative leadership in the development of this remarkable publication.